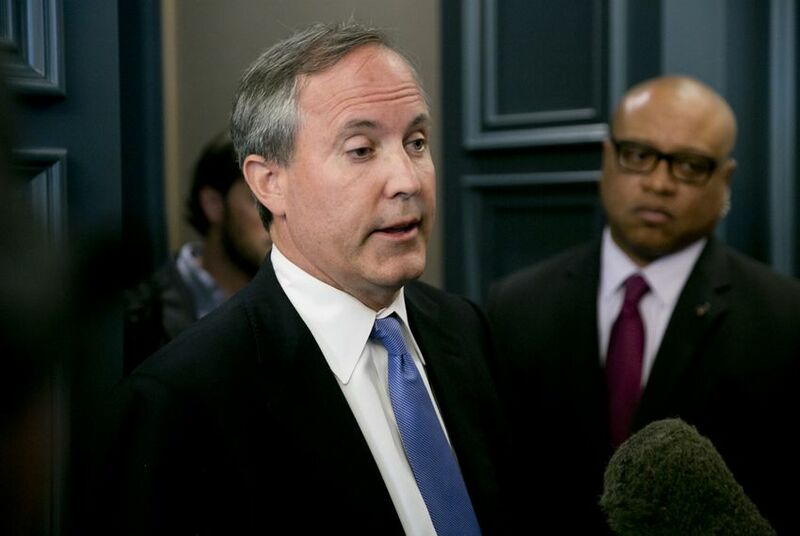 Texas Attorney General Ken Paxton is helping to lead a 28-state effort to strike down the Clean Power Plan, President Obama's landmark effort to to fight climate change. This story has been updated with a comment from the group Environment Texas. “What we need is more reliable energy — not less, and the EPA is trying to stop that,” the Republican said while appearing on a panel in Washington, D.C.
Paxton specifically targeted the Clean Power Plan, President Obama’s state-by-state effort to fight climate change by shifting away from coal power to cleaner-burning natural gas and renewable resources. His appearance on the panel, organized by the conservative Texas Public Policy Foundation, came one day before the U.S. Court of Appeals for the District of Columbia is to hear four hours of oral arguments over the carbon dioxide-cutting rule. Those watching the litigation say the outcome could make or break Obama’s legacy on climate change. Paxton was sitting alongside West Virginia Attorney General Patrick Morrisey at the event, which was streamed online. The two are leading a 28-state effort — along with coal-dependent companies — to strike down the rule. “I can’t think of a more important case that’s working its way through the federal court system now than the litigation against the Clean Power Plan,” Morrisey said. The regulations would force states to slash carbon dioxide emissions from power plants however they see fit — accelerating a shift from coal that started years ago. Carbon dioxide is a potent greenhouse gas that directly contributes to climate change. For Texas — the nation’s biggest carbon dioxide emitter by far — that would mean cutting an annual average of 51 million tons of emissions, down about 21 percent from 2012 levels. Paxton, Gov. Greg Abbott and other Texas Republicans have argued that doing so would cost the state jobs, push electricity costs too high and threaten reliability on the grid. They say the regulations subvert state power. Eighteen states and a litany of health and environmental groups have joined the Obama administration in defending the Clean Power Plan. On Monday, one environmental group criticized Paxton for championing coal interests while challenging the regulation. "Dirty coal just doesn't make sense anymore, economically or environmentally, but Attorney General Paxton appears to want to go down with a sinking ship," Luke Metzger, director of the advocacy group Environment Texas, said in an email. "Texans support transitioning to clean energy and the Clean Power Plan is helping make that possible." Proponents of the rules, backed by early analyses, suggest that market forces and existing policies alone would push Texas most of the way toward its target. One study released in May predicted that coal generation would shrink from about 28 percent of state power generation to 6 percent by 2035 — not factoring in the controversial federal regulation. Aside from inflation, Texans would see “virtually no price increase” if natural gas and solar prices continue to get cheaper as some expect, concluded the study by the Brattle Group, a global research firm that often crunches numbers for Texas regulators. Funding for that study came from the Texas Clean Energy Coalition, which supports natural gas and renewable energy sources. Some who support the coal industry suggested that study didn't paint a full picture of what's happening across the Texas grid. For instance, some coal plant operators may wish to operate facilities even after other fuels become cheaper — a way to recoup costs from major upgrades in recent years. Whether Texas will ever have to comply with the Clean Power Plan is an open question. In February, the Supreme Court granted a request by opponents to halt the regulation as their challenge winds through the legal system. That ruling let Texas leaders off the hook in having to take any action to help address human-driven climate change — the warming phenomenon that many state leaders do not acknowledge exists, despite overwhelming scientific evidence. Tuesday’s oral arguments will prove long, and at times complicated, but will ultimately center on whether the federal Clean Air Act allows EPA to regulate carbon dioxide in the way it has attempted. A recent poll shows most Texans believe state leaders should draw up a plan to shift from coal-fired power to natural gas and renewables — even if the state defeats the Obama administration in a high-profile court battle. The U.S. Supreme Court’s ruling to block President Obama’s Clean Power Plan has helped state Republicans — at least temporarily — dodge major action on climate change. Negotiators from nearly 200 nations, including the United States, struck an unprecedented climate agreement that could have big implications for Texas — and also face big pushback from state leaders.